The ability to demonstrate that a specific health care profession provides valuable and effective services that meet society’s health needs is a major objective for all health care academicians and researchers. Such skills are critical to ensure service reimbursement from an increasingly small pool of health care dollars. Demonstrating clinical effectiveness depends on the reporting of written research results through journal publication so that the health care community and larger society will be able to access and read evidence supporting health care services. Today, several clinical reporting standard guidelines have been created by researchers to enhance the ability of readers to evaluate the quality and value of studies. Journal Article Writing and Publication is the first text to compile those clinical research reporting standards in one source and helps educators and novice researchers to better understand the skills needed for journal publication. Health care researchers must begin using these reporting standards in order to write manuscripts that are both correctly formatted and transparently convey all critical study strengths and limitations. Educators must teach these reporting standards to students who must evaluate research reports as consumers and possible future contributors to the literature through their own writing. Journal Article Writing and Publication by Dr. Sharon A. Gutman (a former editor of the American Journal of Occupational Therapy) provides specific guidelines, based on the most commonly accepted reporting standards, for the preparation and writing of general research studies, intervention effectiveness studies, instrument development and testing studies, and case reports. A section is devoted to helping authors understand the rules governing the reporting of statistical data in text and tables. Separate sections help authors understand the manuscript preparation and submission process, the revision process, and the etiquette guiding communication with editors and reviewers. Guidelines for the preparation of scholarly discussion papers and editorials are also provided. Journal Article Writing and Publication also features a section that aims to help doctoral students and newly minted faculty turn academic work and dissertations into publishable journal articles. Suggestions are provided to help clinicians turn clinical data into research databases that could serve as the foundation for pilot studies. Finally, information is provided to help authors better understand the ethical considerations of publication including plagiarism, dual submissions, inappropriate authorship, copyright, and conflict of interest. Sharon A. Gutman, PhD, OTR, FAOTA is an occupational therapist and associate professor at Columbia University Medical Center. In a career spanning 25 years, she has published 42 peer-reviewed articles, 7 textbooks, 6 textbook chapters, 24 editorials as editor-in-chief of the American Journal of Occupational Therapy (AJOT), and 5 continuing education articles and courses. Dr. Gutman served as the editor-in-chief of AJOT between 2008 and 2014, during which time she helped practitioners and researchers better understand manuscript writing, clinical study reporting standards, intervention fidelity, research methodologies, health literacy, and copyright issues. A major initiative of her editorship was to help researchers better understand the need for evidence-based research to support health care practice and the design and implementation of intervention effectiveness studies. By the end of her AJOT editorship, she had increased the publication of clinical intervention studies by 50% and helped to increase the journal impact factor score from an average of 0.641 over a 10-year period (1998–2007) to a 5-year score of 2.021 in 2014. 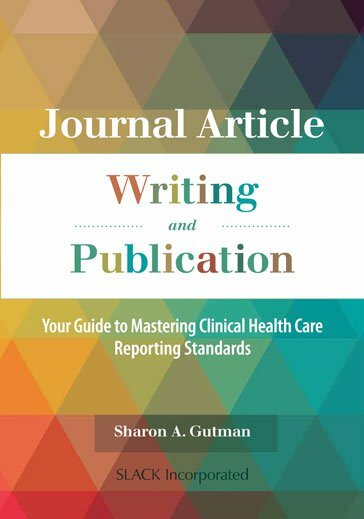 In this book Dr. Gutman summarizes her 25 years of experience and knowledge to help students and researchers better understand the use of health care reporting standards in manuscript preparation, the reporting of statistical data in text, and the manuscript review and revision process. Readers will find this book easy to use and critical to a successful writing career in academia and research.